Oct. 4, 2016 – Democrat Hillary Clinton has turned a virtual tie two weeks ago into a nearly 6-point lead over her Republican rival Donald Trump in the battleground state of North Carolina, according to the latest findings by the Elon University Poll. The jump in support for Clinton comes with nearly two-thirds of likely voters saying she won the Sept. 26 presidential debate, and nearly half saying they now have less confidence in Trump after his debate performance. In the race for N.C. governor, Democrat Roy Cooper has moved ahead of Republican Gov. Pat McCrory and now holds a lead of 4.4 points in the race. The growth in support for Cooper comes as McCrory has faced criticism for his support of the controversial HB2, the so-called “bathroom bill,” that has recently prompted the NCAA, the ACC and other athletics conferences to relocate championships from the state in protest. The poll has found that 55.5 percent of likely voters now believe that the law, which requires people to use the public bathroom in North Carolina that matches the gender on their birth certificate, should be repealed, compared to 34 percent who say it should remain a law. 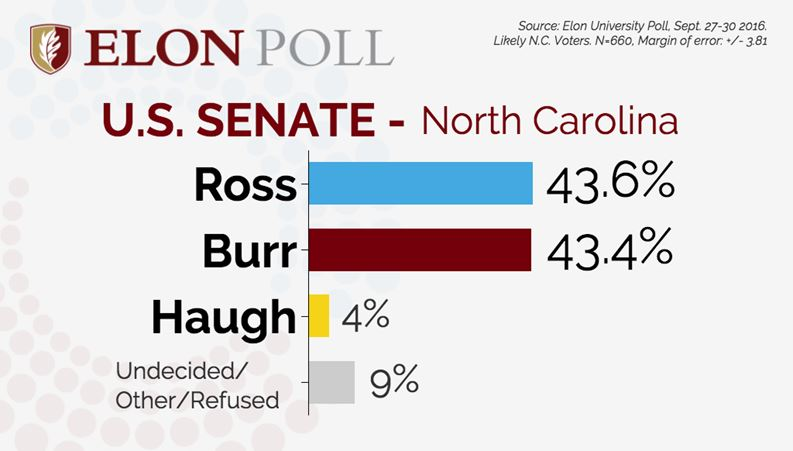 The U.S. Senate race between incumbent Republican Richard Burr and Democrat challenger Deborah Ross is essentially a tie, with Ross holding less than a 1-point lead over Burr — 43.6 percent to 43.4 percent — with a little more than a month to go until Election Day. “That Richard Burr has not fallen in poll numbers like fellow Republicans McCrory and Trump is a positive sign for the Burr campaign’s prospects as a whole,” Husser said. 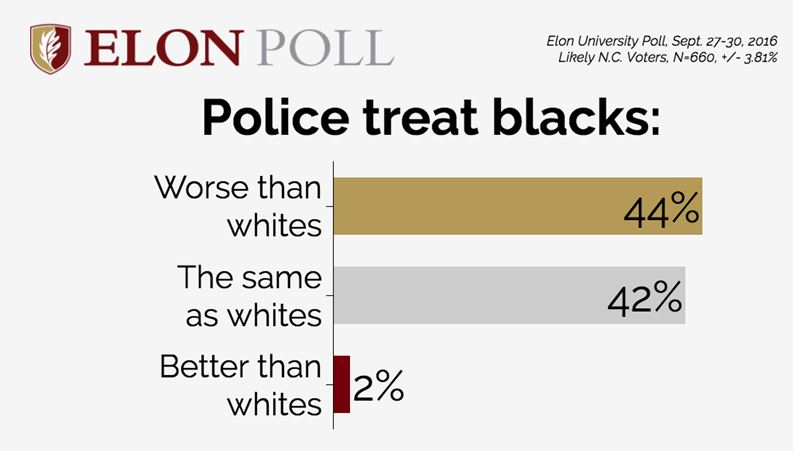 Delving into attitudes about race and policing, the Elon University Poll has found likely voters split on how police treat blacks compared to whites, with 44 percent saying police treat blacks worse, and 42 percent saying police treat whites and blacks the same. Only 2 percent said police treat blacks better. The poll also explored issues raised following the recent shooting death of a black man by Charlotte police that sparked widespread protests. The survey found that 59 percent of respondents said protests after police shootings make matters worse while 27 percent said the protests lead to positive changes. Turning to public access to video recorded by police during shootings, such as that captured by body cameras or dash cameras, the poll found broad support for making all police-recorded videos public, with 58 percent saying they should be available and 36 percent saying police can restrict access. The live-caller, dual frame (landline and cell phone) survey of 799 registered voters was conducted from Sept. 27-30, 2016. Of those respondents, 660 said they are likely to vote in the November election. Survey results in this news release present responses from those self-identified registered voters who say they are likely to vote in the Nov. 8 election and has a margin of error of +/- 3.81 percentage points. Clinton’s increase in support comes after she trailed Trump by close to 2 points during the first Elon Poll of the fall, released Sept. 20. Clinton is now the preference of 44.5 percent of voters while 39 percent plan to vote for Trump. Libertarian Gary Johnson has seen an increase in support, with 9 percent planning to vote for him in November compared to 6 percent of those polled earlier last month. Clinton has retained her support among black voters, with 98 percent planning to vote for her, while benefitting by a widening gender gap in the race. Among those planning to head to the polls in North Carolina next month, 61 percent of female voters plan to voter for Clinton while 56 percent of male voters plan to pick Trump. Two weeks ago, she held a 53-47 advantage over Trump among likely female voters. Looking at how the two performed in the Sept. 26 debate, 64 percent of those likely voters who watched the debate picked Clinton as the winner. Democrats overwhelmingly picked Clinton as the winner, and even 30 percent of Republicans said she won the debate. Among independent voters, 63 percent said Clinton won the debate. Among likely voters who watched, 18 percent said Trump was the winner of the debate. The N.C. governor’s race has also seen a change in leads. 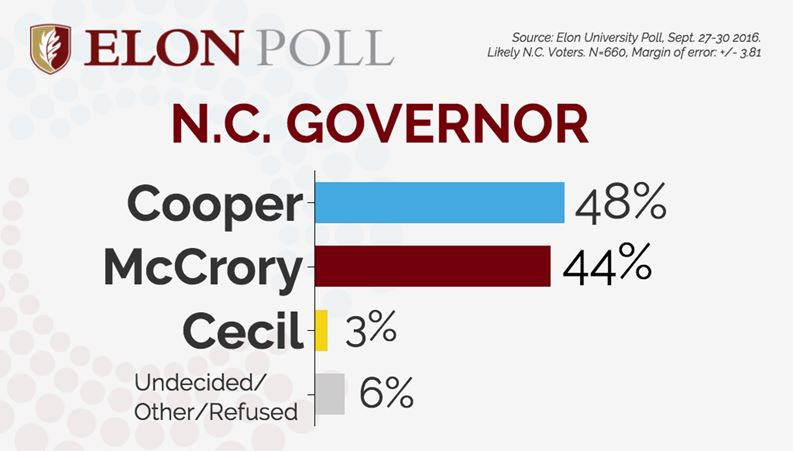 Cooper is now the choice of 48 percent of likely N.C. voters while 44 percent plan to pick McCrory. 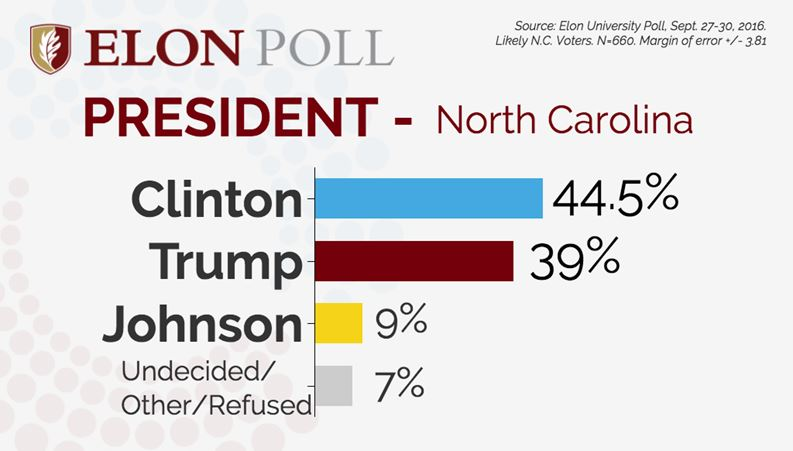 That’s a near reversal of the 49-46 lead that McCrory held in the first Elon University Poll of the fall released two weeks ago. Cooper’s move to the front has come as he has generated stronger support among female voters, with 59 percent now planning to vote for him next month. That compares to a 52-48 split for Cooper among female voters found during the last poll. McCrory continues to lead Cooper with male voters by the same 55-45 margin found during the earlier poll. Questions looking at the police treatment of blacks and issues arising out of the Sept. 20 fatal shooting of Keith Scott by a Charlotte police officer show major divisions among racial and political party lines. Among black voters, 82 percent said police treat blacks worse than whites while 33 percent of white voters had the same opinion. Looking at party affiliation, 72 percent of Democrats said police treated black worse than whites, compared to just 15 percent of Republicans. Nearly half — 47 percent — of black voters said protests following police-involved shootings lead to positive change over the long term, compared to 22 percent of white voters who had that view. Among Republicans, 84 percent said these protests make matters worse, while 39 percent of Democrats took that stance. The release of police-recorded video following officer-involved shootings has been at the center of many protests, including those in Charlotte. North Carolina enacted a new law on Oct. 1 that allows for the release of those videos only by court order, which will restrict public access to the video. 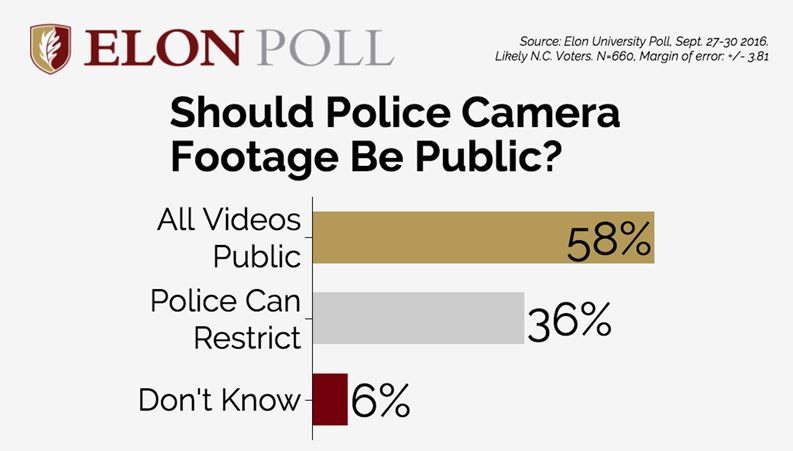 The Elon University Poll found that black voters, Democrats and independents were all more likely to support broad public access to the videos. White voters were divided on the issue, with 49 percent supporting making all videos publicly available and 44 percent saying police can restrict access. Among Republicans, 58 percent said police should be able to restrict access while 37 percent said all videos should be publicly available.